Born in 1954, Oliveira de Frades, Viseu. Pós-graduation studies at LAAS du CNRS (Laboratoire d'Automatique et d'Analyse des Systèmes du Centre National de la Recherche Scientifique), Toulouse, France: the degree of DEA (MsC),1981, and Docteur Ingénieur (PhD), 1983, both on Automatic Control. director and/or participant of several research projects in cooperation with portuguese industries (pulp and paper, cement, ceramics) and in several international programs (Comett, ESF- European Science Foundation, EU-TMR, etc.). I have also supervised several MsC and PhD thesis. 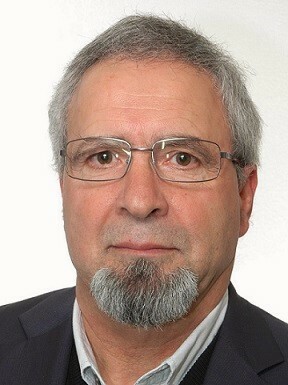 one of the founders of CISUC- Center for Informatics and Systems of the University of Coimbra, where he created and directs the Adaptive Computation Group ( with research activities concerning neuro-fuzzy systems, adaptive, on-line learning and intelligent control; genetic multi-objective optimization; hierarchical and large scale optimization; computer vision for industrial quality inspection). neuroinformatics: applications of soft-computing and computational intelligence to model and analyse brain signals, namely EEG and functional imaging (iFMR), and to apply them to seizure prediction in epilepsy and to pattern analysis of brain signals in aging people in order to find early indications of possible evolution to aging diseases. data-mining for industrial process monitoring and for neuro-informatics studies. A computational framework to develop fuzzy systems from data, creating and evolving the fuzzy rules accordingly to the novelty content of the data.